In the GOP’s attempt to repeal the Affordable Care Act, California would lose a lot of federal funding. Texas would gain a lot in the short term, but experts worry Texas would not use the money well. The Senate is taking one more stab at repealing the Affordable Care Act. Republicans say they’ll vote on what’s known as the Graham-Cassidy bill next week. Among other things, it would dramatically redistribute federal funds to states. And generally, states that expanded Medicaid stand to lose billions of dollars. The rest would see a short-term influx of funds. We’re going to hear from one of those states, Texas, in a minute. First, from KQED in San Francisco, April Dembosky explains why California would be one of the hardest hit states. APRIL DEMBOSKY, BYLINE: The new Graham-Cassidy legislation would take money from states that have invested heavily in the Affordable Care Act, then redistribute it to other states that haven’t. Aviva Aron-Dine is with the Center on Budget and Policy Priorities. AVIVA ARON-DINE: For a state like California or a Massachusetts or a New York, exactly the states that might be most motivated to at least try to preserve the ACA coverage gains – those are the states that would face the deepest cuts to their federal resources. DEMBOSKY: The bill’s authors say their plan gives states more flexibility to build their own health systems. But California would lose 35 percent of its funding by 2026. That means millions of people with Medicaid and exchange plans would lose their insurance. A lot of those people are entrepreneurs and their employees. The head of the Small Business Majority in California, Mark Herbert, says the health funding cuts are bad for the economy, too. MARK HERBERT: It would be massively destabilizing to the ability of small employers to attract talent. It would be very difficult for entrepreneurs and self-employed folks to access some level of coverage. DEMBOSKY: Under the Affordable Care Act in California, a million and a half small business owners and employees got health coverage, and the state’s overall uninsured rate dropped by more than half. For NPR News, I’m April Dembosky in San Francisco. ASHLEY LOPEZ, BYLINE: I’m Ashley Lopez in Austin. At first glance, it looks like Texas comes out as one of the big winners. Texas will get a windfall of $35 billion to help replace Obamacare exchanges and other programs, more than any other state. State officials get to decide how they want to spend that money. But Stacey Pogue with the Center for Public Policy Priorities in Austin says that doesn’t necessarily mean this is an improvement. STACEY POGUE: Regardless of the size of the block grant, there’s just no assurance that it would translate into good coverage or coverage that’s affordable as what we have today. LOPEZ: Texas already has the highest number of uninsured folks, and Pogue says the state just doesn’t have the infrastructure in place to expand coverage to more people. It didn’t expand Medicaid, and the state didn’t set up its own exchange. They used healthcare.gov. POGUE: There’s no planning and no thought put into, how would we create affordable coverage for low-income Texans unlike the 31 states that have expanded Medicaid, have done some central planning? And Texas would be starting from scratch. LOPEZ: She says it will also take a lot of political will to make sure the state is expanding health care. Pogue says that has been lacking among state lawmakers for years. And in order to get the block grant, states need to create something workable by 2020. For comparison, it took Massachusetts four years to set up its pre-Obamacare insurance market. STACY WILSON: We are very concerned. LOPEZ: That’s Stacy Wilson. She’s the president of the Children’s Hospital Association of Texas. She says this pot of money from Cassidy-Graham also doesn’t solve problems for Medicaid, 70 percent of which covers children. Wilson says that’s because the federal government would pay a fixed amount per person per capita cap, which locks in how much the state gets per Medicaid enrollee. WILSON: We have very low per-capita costs already, and we get locked into that forever. LOPEZ: A conservative policy group in Texas is also not happy about the bill. However, their concern is that it actually doesn’t go far enough to repeal Obamacare. For NPR News, I’m Ashley Lopez in Austin. CHANG: This story is part of a partnership with NPR, local member stations and Kaiser Health News. People hold Catalan pro-independence flags outside the high court in Barcelona on Thursday. After a day-long protest that lasted well into the night, several thousand independence supporters gathered again in front of the high court in what influential separatist organizations said would be a “permanent mobilization” until detained Catalan officials are freed. Tens of thousands of people have taken to the streets in Barcelona, protesting the Spanish government and expressing support for a planned Oct. 1 vote on Catalan independence. Spain considers the referendum to be illegal. On Wednesday, Spanish police with court-ordered search warrants seized millions of ballots and detained more than a dozen Catalonian politicians. A top treasury official is being held on sedition charges, the BBC reports. “It started peacefully, with some 40,000 protesters singing the Catalan national anthem outside a government building raided by Spanish Civil Guards. But clashes broke out overnight,” she says. “Police cars were vandalised and Civil Guards trapped for hours inside a building. 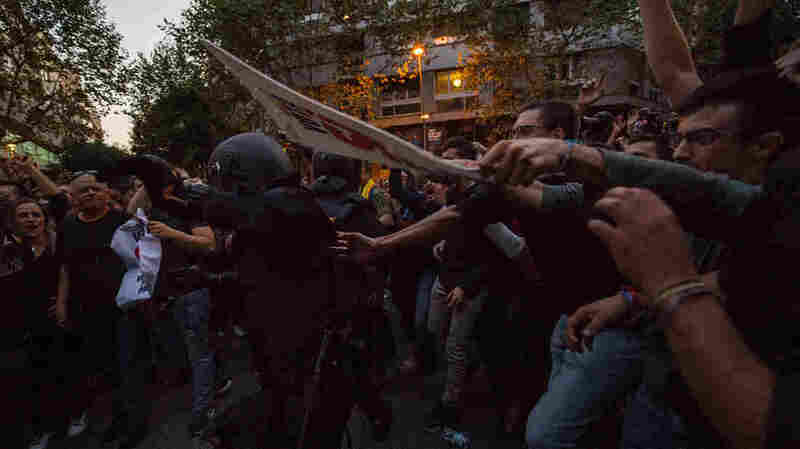 “Catalan separatists have called for indefinite protests,” Frayer reports. Demonstrators clash with Spanish National Police officers outside the headquarters of a pro-independence political party in Barcelona, Spain, on Wednesday. 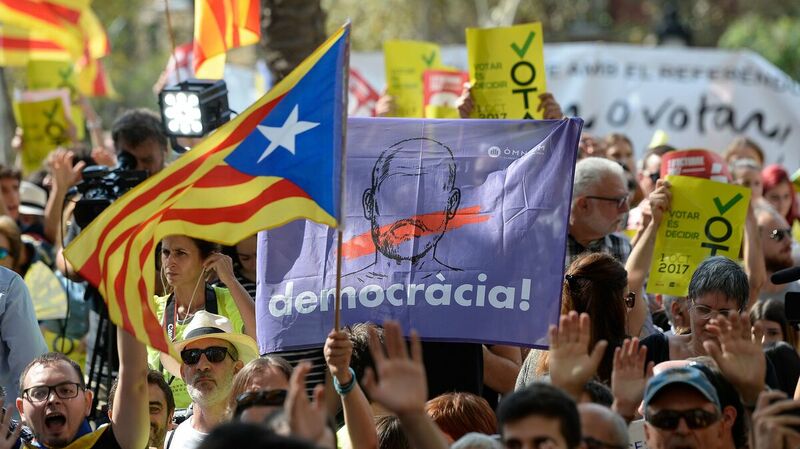 “Catalan Vice President Oriol Junqueras acknowledged that the crackdown had disrupted the referendum plans. ‘It’s evident that we won’t be able to vote like we have done in the past,’ Junqueras told broadcaster TV3. The prime minister of Spain has warned Catalonia of “greater harm” if the referendum is carried out, and the Constitutional Court says it will impose daily fines of thousands of euros on individuals helping oversee the vote, the AP writes. Catalonia, a prosperous region in northeast Spain, has its own language and culture, and has been granted some autonomy within Spain. Separatists have long called for complete independence, with the campaign picking up steam over the last few years. In 2014, a symbolic vote (not acknowledged by Madrid) registered overwhelming support for independence, although turnout for the vote was low. One recent poll found about 41 percent of Catalonians support independence. 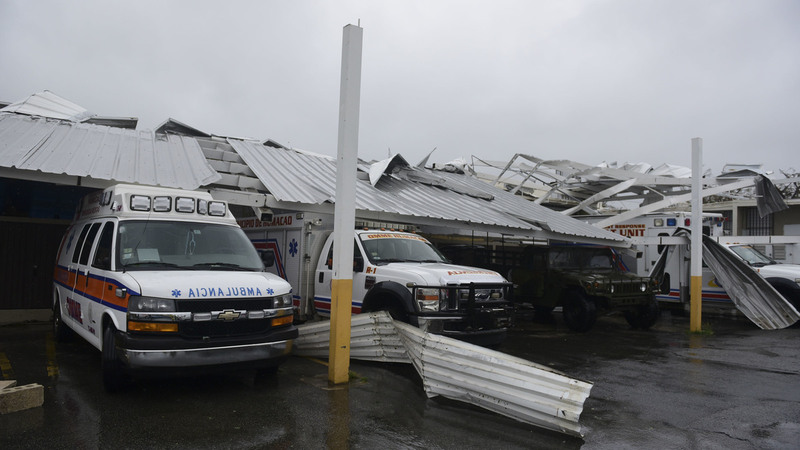 Rescue vehicles stand trapped under a collapsed awning while Hurricane Maria lashed Humacao, Puerto Rico on Wednesday. Back-to-back natural disasters in Mexico and across the Caribbean have left millions of people reeling. The 7.1 magnitude earthquake that struck central Mexico on Tuesday crumpled buildings and killed more than 200 people. And it hit while Mexico was still recovering from another deadly and powerful earthquake in the southern part of the country. On Wednesday Hurricane Maria dealt Puerto Rico a direct punch, knocking out power across the entire island. Its rains have led to widespread flooding and its heavy winds took roofs, snapped power lines and uprooted trees.”The Puerto Rico and San Juan we knew yesterday is no longer there,” Mayor Carmen Yulín Cruz told NBC News. Other parts of the Caribbean have had no time to catch their breath after surviving Hurricane Irma only to be ravaged by Maria. As crews attempt to clean up and distribute aid, Kenneth Mapp, governor of the U.S. Virgin Islands, issued a 24-hour curfew on Thursday. And the Associated Press reports that Maria left at least nine people dead in Dominica and Guadeloupe. Search and rescue groups carry a body through the rubble of a collapsed apartment building in Mexico City on Wednesday. My Brother’s Workshop is a St. Thomas-based charity that has been running a daily lunch program on the island. Americares delivers medicine and aid to local health providers and is readying emergency kits for future crises. GlobalGiving is supplying emergency supplies across the Caribbean in addition to longer-term recovery help. All Hands Volunteers is a volunteer-driven disaster relief organization awaiting “the green light” from first responders to get back to St. Thomas to help. Catholic Relief Services is working with local governments across the Caribbean to provide relief including shelter, water and kitchen kits to hurricane victims. The Florida-based National Puerto Rican Leadership Council Education Fund is helping coordinate relief efforts. President Carlos Guzman tells NPR they are accepting diapers, formula and water. But he adds, “money is better because all the airports are shut down,” and the group is trying to get goods over the island via private jets. 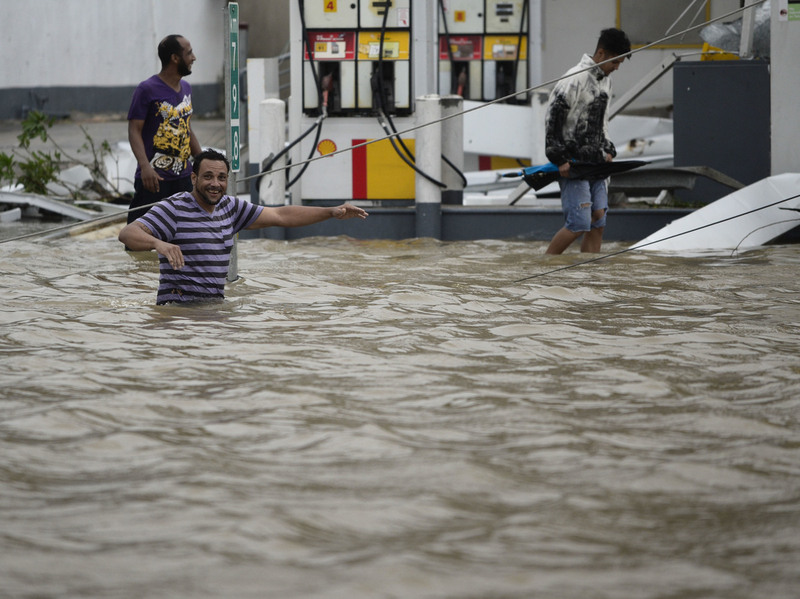 People walk next to a flooded gas station in Humacao, Puerto Rico on Wednesday. Topos México, an all-volunteer rescue brigade, is working to dig out victims and is accepting support. Donation information is on their Twitter page. The Mexican Red Cross or Cruz Roja Mexicana has teams assisting in search and rescue operations.It has also put together an Amazon wish list of needed items, including tents, baby supplies and batteries. Oxfam is asking for funds as it develops a response plan in coordination with the Mexican government and other aid organizations. Save the Children is raising money for a children’s relief fund. 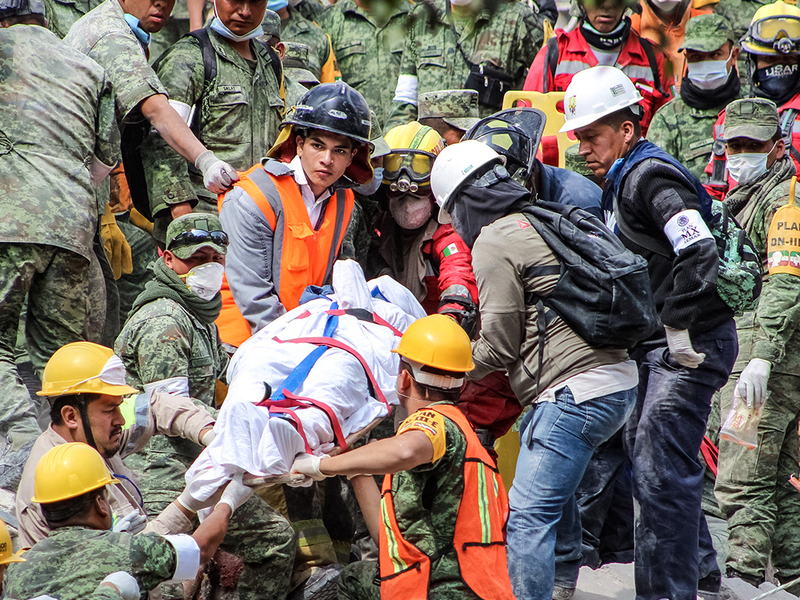 Rescue crews try to free a trapped child at the Enrique Rebsamen primary school in Mexico City on Wednesday after a powerful earthquake jolted central Mexico a day earlier. “As when giving with any charity, try and do your due diligence about the organization you are giving to. Do friends vouch for it? Has it been endorsed by other trustworthy organizations? And watch out for scams,” reports NPR’s Carrie Kahn from Mexico City. A good place to start is by looking up charities at Charity Navigator or Guidestar. Both are themselves charities that evaluate other nonprofits and track where their money goes. 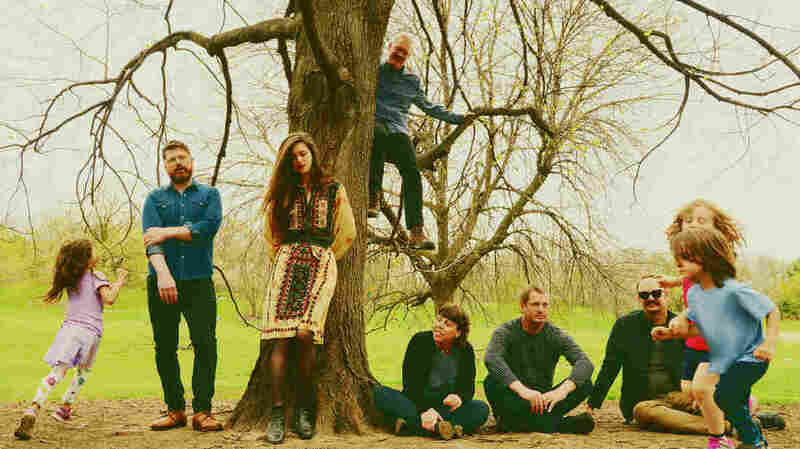 Portland, Ore.’s The Decemberists and British singer-songwriter Olivia Chaney have teamed up to cover traditional English (and Irish and Scottish) folk songs under the name Offa Rex. It’s a match made in harpsichord heaven. Colin Meloy of The Decemberists has always dreamed of recording an album of British folk songs, and found the perfect English collaborator in Chaney. For Chaney, Meloy’s slightly-less-reverent American perspective was the push she needed to cover the traditional songs she loves. As you’ll hear in my chat with Chaney and Meloy, the collaboration was definitely a balancing act — and it kind of still is. We’ll also talk about how the idea for an old-timey album began with a tweet. This episode also features a performance by Offa Rex of “The Queen of Hearts,” recorded live on stage at the XPoNential Music Festival in Philadelphia. Hear it all in the player above. Since the beginning, Corbin — formerly known as Spooky Black — has, in his languid and gurgling and romance-afflicted music, foregrounded the landscapes of his home state, Minnesota. Flicking through the search results of his early videos, there’s always a forest visible. With “Hunker Down,” the forest is not only present, but central. Corbin is heading up north, to “where 61 touches the waterline,” referencing the highway that traces Minnesota’s arrowhead, along the western edge of Lake Superior. The woods are an escape, and it can be a crushing one. “We’re too deep in the green and spruce,” he sings, spending time watching cabin-films on VHS and a s***** little television. In his now-three-year-old breakout song and video, “Without You,” Corbin sang pretty, his voice like a tumbled agate. These days, those soft contours still round out the bookends of his phrases, but between them a more volcanic beast rears. The change is both physio- and psychological; getting grown necessitates the hewing of our lumber, inside and out. But the maturity has, much like King Krule, given Corbin a promising confidence in his artistic powers. Unlike Krule, however, Corbin never seemed to need a humbling of his place in the world. Rescue personnel work at the scene of Enrique Rebsamen school, which collapsed when an earthquake struck on Tuesday. Workers have been able to communicate with a girl who’s alive — but trapped in the rubble. A strong earthquake that hit Mexico City and other central areas has killed at least 245 people, officials say. Search teams are working feverishly to find any survivors who were trapped — including at least one girl who’s among students caught when the quake turned their school to rubble. The girl, 12, has been able to communicate with emergency crews, and she has wriggled her fingers for them through the wreckage. She was located alive in the debris of the Enrique Rebsamen School, south of the capital. The building collapsed during Tuesday’s 7.1-magnitude quake. “It is a heartbreaking scene. Hundreds of volunteers and rescue personnel have flooded to this neighborhood around the school … all are emotionally drained, tired, but just holding on to hope they can reach some of the children alive … under all that rubble. “One wing of the school, three stories just pancaked in the powerful quake. One right on top of the other, making the rescue effort and chances of survival very difficult. 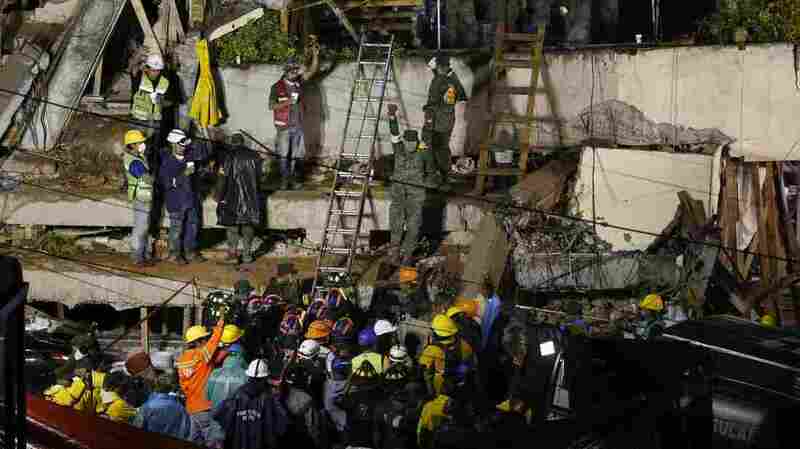 Rescue workers have spent hours trying to free the girl and anyone else who might have survived. In addition to heavy rubble that sits precariously in the debris pile, the effort has been frustrated by heavy rain that fell overnight. The girl’s name is Frida Sofia, a doctor who’s working with the rescue team tells the Associated Press. The doctor added that the girl says there are several other children near her who are also alive. The name Frida Sofia became a top-trending term on Twitter — but there are questions over whether it’s the girl’s name. Media outlets in Mexico have reported it, especially after journalist Joaquín López-Dóriga tweeted it. But teachers say there’s no student at the school with that name — and El Universal reports that a rescuer used the name as a way to communicate with the girl. 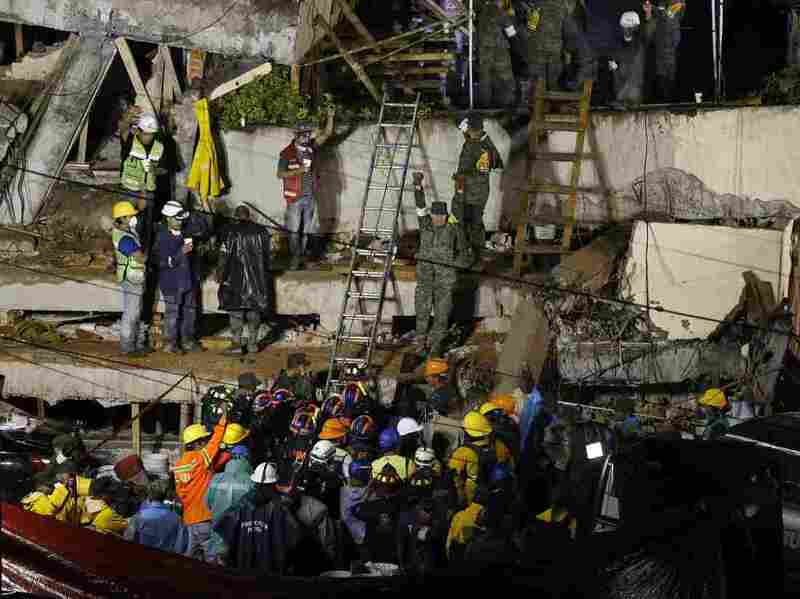 Rescuers, firefighters, policemen, soldiers and volunteers look for survivors in a flattened building in Mexico City on Thursday, as part of a widespread search for people who lived through a strong earthquake. Authorities say they’ve pulled dozens of survivors from damaged buildings. But Mexico City’s Mayor Miguel Ángel Mancera says more than 35 buildings collapsed, from offices and apartments to schools. Mexico City’s metro service says it’s allowing people with rescue tools — picks, shovels and mallets — to ride on its vehicles. And for the second day, the service is free. Authorities say they’ve pulled more than 50 survivors from damaged buildings. 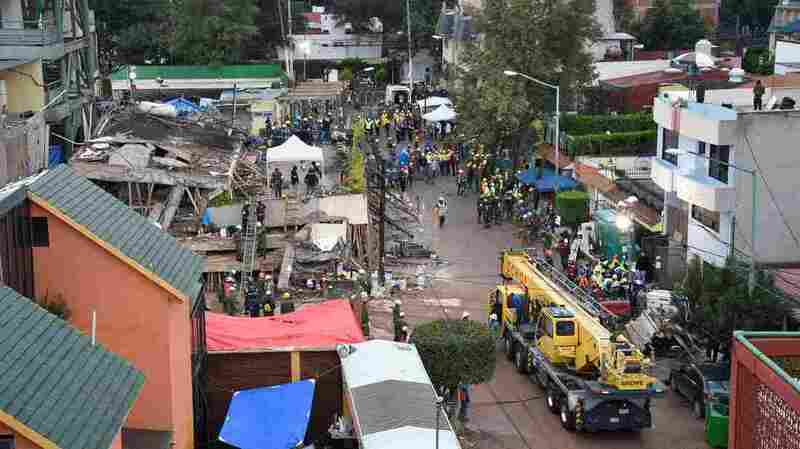 But Mexico City’s Mayor Miguel Ángel Mancera says more than 35 buildings collapsed, from offices and apartments to schools. In Mexico City and outlying areas — including the city of Jojutla, in Morelos state, where many houses and buildings were reduced to rubble — soldiers, police, fire fighters, and volunteers have alternated between working to find survivors and undergoing pauses of total silence, as rescuers call out for anyone who’s still alive to respond. Jojutla Mayor Alfonso de Jesus Sotelo “says 2,000 buildings are damaged, 300 of those totally collapsed. 16 people have died, including 4 children,” Frederick says. In Puebla, where the epicenter of the quake was located in the western part of the state, Gov. Antonio Gali gave a grim account of the losses on Thursday morning. A screen at a railway station in Seoul on Friday shows a news graphic of a North Korean missile launch. President Trump said on Thursday there would be additional sanctions on North Korea. The Trump administration is preparing to announce additional sanctions on North Korea, in response to Pyongyang’s renegade nuclear program. Trump teased the announcement Thursday morning during a meeting on the sidelines of the United Nations General Assembly in New York. “We will be putting more sanctions on North Korea,” the president told reporters during a meeting with Afghanistan’s president, Ashraf Ghani. Trump is set to meet Thursday with leaders of South Korea and Japan, two U.S. allies that have been rattled by North Korea’s nuclear and missile tests. 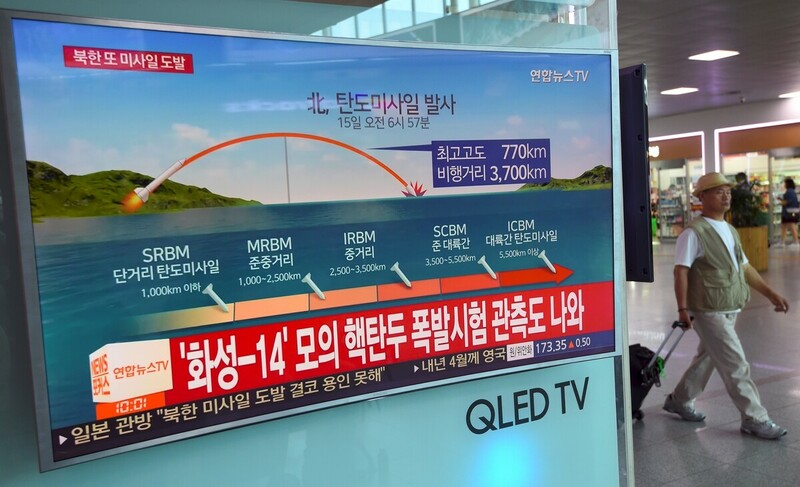 Last week, North Korea launched a ballistic missile high over Japanese territory. During his speech to the U.N. General Assembly on Tuesday, Trump warned that the United States would “totally destroy” North Korea if forced to defend itself or its allies against a nuclear attack. But he held out hope that could be avoided through economic and diplomatic pressure. Trump praised the U.N. Security Council for passing two recent resolutions against North Korea that the president called “hard hitting.” But he added additional measures would be necessary to rein in North Korean leader Kim Jong Un. Treasury Secretary Steven Mnuchin is scheduled to brief reporters later Thursday. Angel Olsen’s new rarities collection, Phases, comes out Nov. 10. Angel Olsen performs with incredible intensity, whether she’s performing at a solo acoustic whisper or cranking out searing rock ‘n’ roll at the head of a band. Her most recent album, last year’s My Woman, tilted toward the big and brash, signaling greater volume to come. But on Nov. 10, she’ll return with Phases, a new collection of B-sides, demos and previously unreleased songs that capture most every dimension she’s revealed so far. Today, Olsen releases the album’s first two tracks: “Special,” which she’d recorded during the making of My Woman, and “Fly on Your Wall,” which came out earlier this year as part of Bandcamp’s Our First 100 Days benefit project. “Special” is particularly, well, special — a churning, slow-building seven-minute jam about fear of a failure to meet expectations. She needn’t have worried. One look at (and listen to) the cross-dressing, Asian rock band SsingSsing and you would hardly think they’re singing music inspired by traditional Korean folk. But SsingSsing isn’t like any other band I’ve ever seen or heard. The understated music, the small dramatic gestures and the costumes all combine for one of my most memorable Tiny Desk Concerts of all time. SsingSsing’s self-titled EP can be found here. Producers: Bob Boilen, Bronson Arcuri, Morgan Noelle Smith; Audio Engineer: Josh Rogosin; Videographers: Beck Harlan, Kara Frame, Bronson Arcuri; Production Assistant: CJ Riculan; Photo: Claire Harbage/NPR. 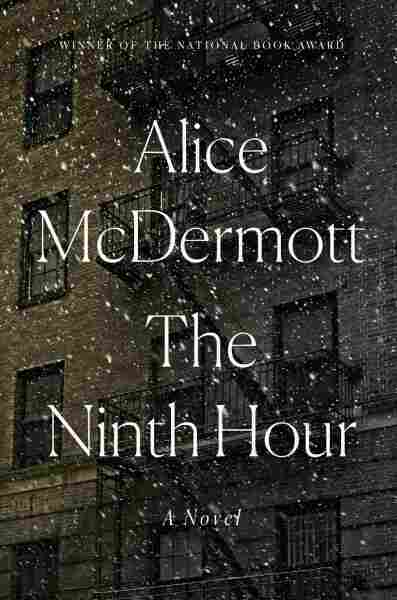 The Ninth Hour, McDermott’s eighth novel, is about an order of nursing nuns and the needy families, elderly shut-ins, disabled invalids and strapped widows they care for in a predominantly Irish Catholic neighborhood of Brooklyn. Who cares about nuns? Read this book, and you will. The Little Nursing Sisters of the Sick Poor are not the cruel knuckle-rappers that dominate parochial school fiction. The unpaid, unlicensed equivalent of social workers and visiting nurses, they trudge from one derelict walkup to another, bearing apple sauce, poultices, and aspirin. They change sheets, diapers, and bedpans, scrub homes and wipe bottoms. They may toil thanklessly and view their mission as “the pure, clean antidote to filth, to pain,” but McDermott makes one thing clear as she burrows deep into these Sisters’ psyches, histories and not always sanctioned behavior: They are distinct, opinionated individuals underneath their impersonal habits. Despite their vision-blocking bonnets, they see everything, including the ugly side of humanity — nasty, drunken husbands, a brother who abuses his sisters, a whining, ingrateful invalid, and greedy priests who live in relative comfort while taking credit for their ceaseless labors. But they are also willing to look the other way and flout Church rules and moral edicts when they see fit. Although exhausted, the elderly nun spins into action — directing her younger Sisters to wipe away all evidence of the tragedy before Annie returns home. Noticing the fine stitching on the new widow’s handkerchief, she secures a job for her in the convent’s basement laundry. She also tries to arrange a Christian burial for the deceased, even though it involves burying the actual circumstances of his death. “It would be a different Church if I were running it,” she comments tartly. Narrated more than half a century later by Annie’s grandchildren (who refer, occasionally, to “our father” or “our mother”), the novel focuses primarily on the early decades of Annie’s daughter’s life. Sally, raised under the benign influence of three nuns, considers taking the vows herself. But a powerful chapter in a book filled with them dramatizes Sally’s change of heart, on a nightmarish night train to Chicago where her vocation is sorely tested by a series of crude encounters. God is definitely in the details in this book, named for the hour of afternoon prayer. God is definitely in the details in this book, named for the hour of afternoon prayer. McDermott vividly describes the ministrations involved in “an invalid’s cosseted routine” — including blood-stained bedclothes and eruptive bowels. In her hands, the unending round of the convent laundry becomes a riveting read: Linens, habits, capes, bonnets, handkerchiefs and menstrual rags must all be boiled twice, inside out and then right side out, with specific noxious compounds, wrung and then wrung again, starched, ironed and mended, before being sent “back into the world like a resurrected soul.” Even the clothespins are washed monthly. By immersing readers in such homely details, The Ninth Hour, like Colm Toíbín’s Brooklyn, evokes a narrowly confined, simpler, largely bygone world. But McDermott also addresses big, universal questions — about what constitutes a good life, and about how to live with the knowledge of “that stillness, that inconsequence, that feral smell of death.” Her novel encompasses base hungers, sin, guilt, reparations, secrets, and depression — so little understood at the time. And more: The Ninth Hour is also about love, both forbidden and sanctioned, albeit with the caveat that “Love’s a tonic … not a cure.” This enveloping novel, too, is a tonic, if not a cure.